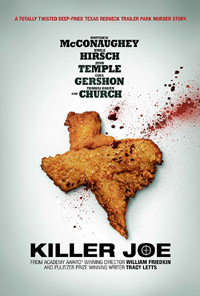 Skimming along the Texas trailer-park underbelly, Killer Joe has a young douche bag petty drug dealer planning to get his mother knocked off (suspecting her of stealing his stash). He heard from her boyfriend that she has a life insurance policy with his younger sister as beneficiary. Unable to do this himself, he hires a cop who moonlights as a contract killer. But, Joe doesn't come cheap, and wants his money up front. Only able to pay him once the policy pays out, Joe takes the job under one condition – he wants the younger sister as collateral. This assortment of lowlifes make for a dirty little movie where dubious morals and lack of conscience is commonplace. Some nasty scenes will shock some viewers, but I'm sure there are many out there who get up to far worse(!). While McConaughey seems to put his all into the character, I feel he was a little miscast, as his attempt at trying to be a nasty scumbag is not too convincing. As in most crime related movie themes, here the main driving force is again the almighty dollar, and to me that lust is the ultimate indictment of humanity's sad spiral into moral weakness and material addition. With some standout career highlights like The French Connection, The Exorcist and To Live And Die In L.A., director Friedkin also had a few lower key production in his filmography (like The Guardian), and while this isn't his worst, I feel this one leans more towards the bottom pile.